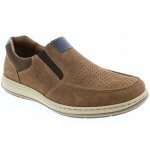 Rieker Salmon 17367 men's slip on shoe. It features a soft suede leather upper with contrast stitching and punched hole detailing which provides an athletic look. The twin elasticated gussets allow for adjustability and allow the shoe to be slipped on and off with ease. Rieker's Anti-Stress technology provides shock absorption and lasting comfort, making it ideal for all day wear. Padded collars provide further comfort and the cushioned insole is fully removable, allowing the use of orthotics. Rieker salmon is a cool and casual addition to your summer wardrobe.